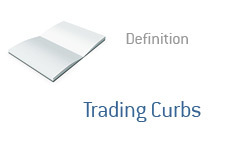 Trading Curbs - What Does It Mean? What are trading curbs? What is the definition of a trading curb? A trading curb is also known as a "circuit breaker". To understand what a trading curb does, think of what happens when you have an electrical fire in your home. What's the first thing that you do when you have an electrical fire? You flip the circuit breaker that controls the electricity in the area. Now that there is no longer electricity flowing, you can try to figure out what caused the fire in the first place. Trading curbs are no different. Let's take the New York Stock Exchange (NYSE) as an example. The exchange has THREE different trading curbs that take effect when the exchange trades down 10, 20 or 30% on any given day. The total percentage needed to enact a trading curb is calculated at the beginning of every quarter. For instance, if the DJIA was trading at 10,000 as of December 31st, then the trading curbs would take effect if the exchange traded down 1,000, 2,000 or 3,000 points at any point during the quarter (over the course of a single day). 10% Curb - If the DJIA trades down 10% before 2 pm, then the NYSE will be halted for one hour. If the DJIA trades down 10% between 2-2:30 pm, then the NYSE will be halted for 30 minutes. If the DJIA trades down 10% after 2:30 pm, then there will be no halt at all. 20% Curb - If the DJIA trades down 20% before 1 pm, then there will be a two hour halt. If the DJIA trades down 20% between 1-2 pm, then there will be a one hour halt. If the DJIA trades down 20% after 2 pm, then the NYSE will be halted for the day. 30% Curb - If the DJIA trades down by 30% over the course of a single day, then the DJIA will automatically close for the rest of the day. What is the point of trading curbs? From NYSE.com - "By implementing a pause in trading, investors are given time to assimilate incoming information and the ability to make informed choices during periods of high market volatility." Trading curbs were put into place on the New York Stock Exchange after "Black Monday" in October of 1987.